In the grand scheme of things there's precious little left for Ron Hawkins to accomplish on the Toronto music scene. The former Lowest Of The Low frontman is a respected veteran who continues to release solid new music. 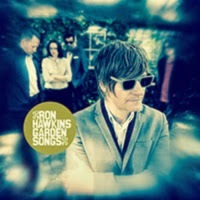 The latest offering, Garden Songs, comes out on February 3rd. This time Hawkins adds the twist, probably as a challenge to himself, as the entire album was recorded and mix in one short week. For this effort Hawkins has teamed up once again with the Do Good Assassins. Unlike the guitar rock focus of their previous collaboration, this is a far more sparse album. The focus of tracks like "Waitin' On Something That's Already Here", "D.F.W. ", and the heartbreaking "South Ontario" falls squarely on Hawkins' lyrics and his ability to deliver them with the appropriate balance of gravitas and cheekiness. The Assassins earn their keep by keeping things fresh. Be it a well-placed cello in the guitar punctuated "Peace and Quiet", or a horn-fed crescendo in "Kingdom of the Sun", they keep things from becoming samey. The best rock song is the toe-tapping title track. The strongest hook is a subversive one on "Saskia Begins". A couple of tracks seem like short cuts. Hawkins offers up stripped-down, reworked versions of previously released songs "Propellers" and "Small Victories". Garden Songs is an interesting release from an artist who isn't afraid to do whatever he wants. However, if you love Ron Hawkins for the LOTL rock songs, then this isn't the record for you. Ron Hawkins plays the Drake Underground in Toronto February 5th-7th.